So confession time: this is the first time I have cooked both pork chops AND asparagus. I really have no explanation for why I’ve never cooked either, other than that I always thought pork chops were nothing special and asparagus seemed too hard to cook (I know, I know, lame excuses here). 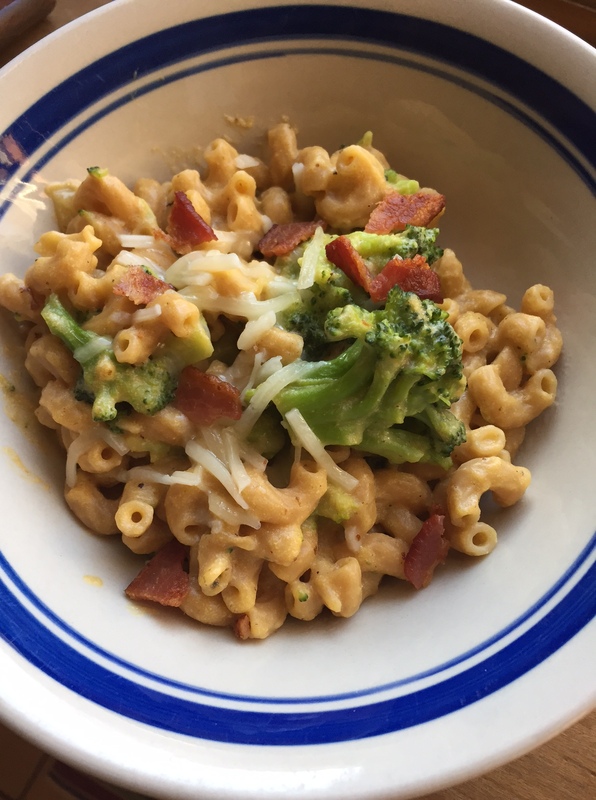 But this recipe looked too good not to try! And I found asparagus on sale and decided they would be the perfect side for my (hopefully-they-turn-out-well) pork chops. Everything was so good and also so easy. This recipe will definitely be on repeat! 3 boneless pork chops, about 1 lb. 1.) Preheat oven to 400 F. Spray a baking sheet with cooking spray and layer asparagus evenly, ends trimmed. Drizzle with olive oil and sprinkle with garlic powder, salt, and pepper. 2.) While asparagus is baking, combine butter, thyme, lemon juice, goat cheese, and salt and pepper in a small bowl and set aside. 3.) Heat 1 tsp olive oil in a large skillet over medium-high heat. Sprinkle one side of pork chops with desired seasonings and place pork, seasoning side down, in the skillet. Let cook for 3 minutes and season the uncooked side, then turn pork over. Cook for about 4 minutes and remove from pan. 4.) 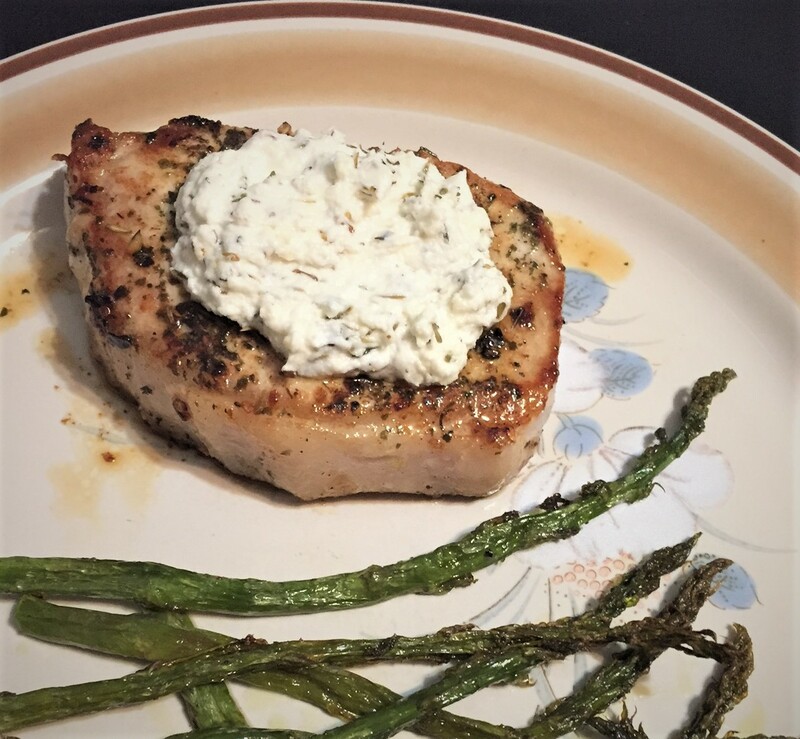 Top each pork chop with 1/3 of the goat cheese butter and serve with a side of asparagus. 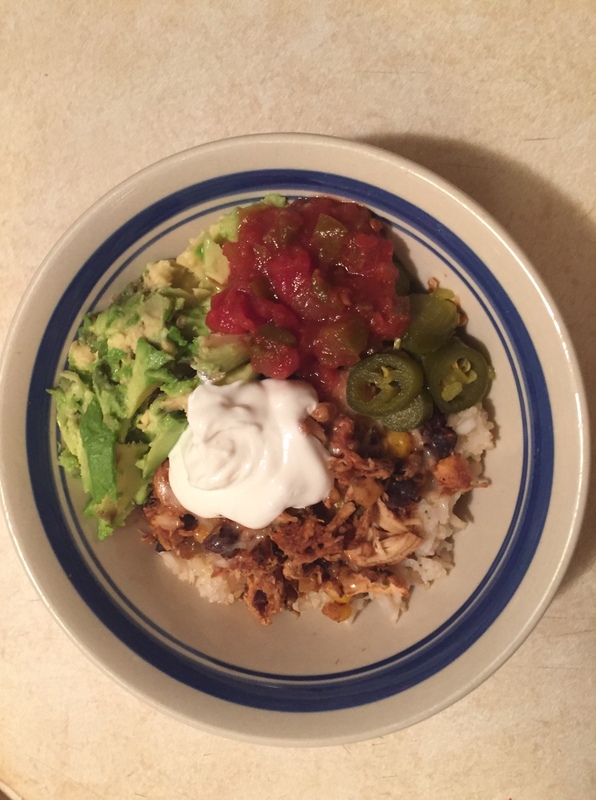 Nothing better than a burrito bowl! 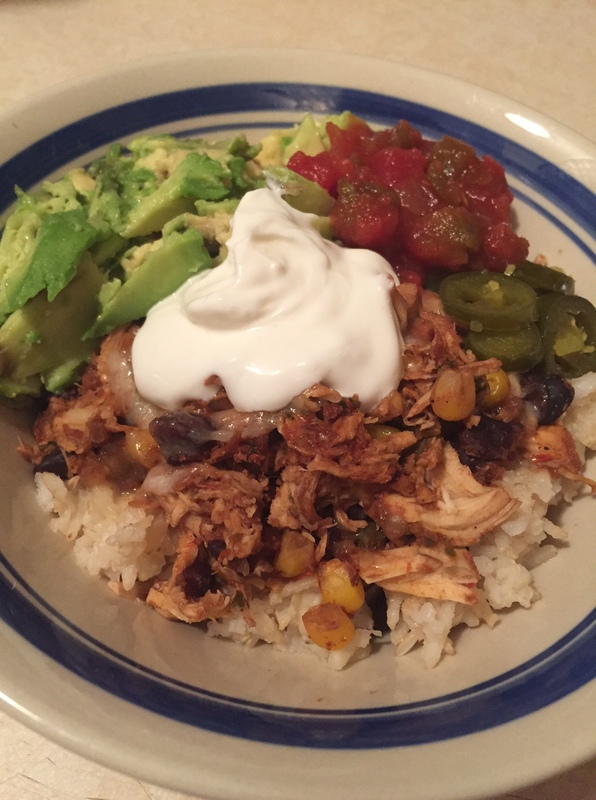 This is a super easy recipe too, since the chicken, corn, and bean mixture is made right in the crock pot. That way you can come home from work, make some quick-cooking rice, and build this bowl in less than 15 minutes. It’s also great for packing for lunches during the week! 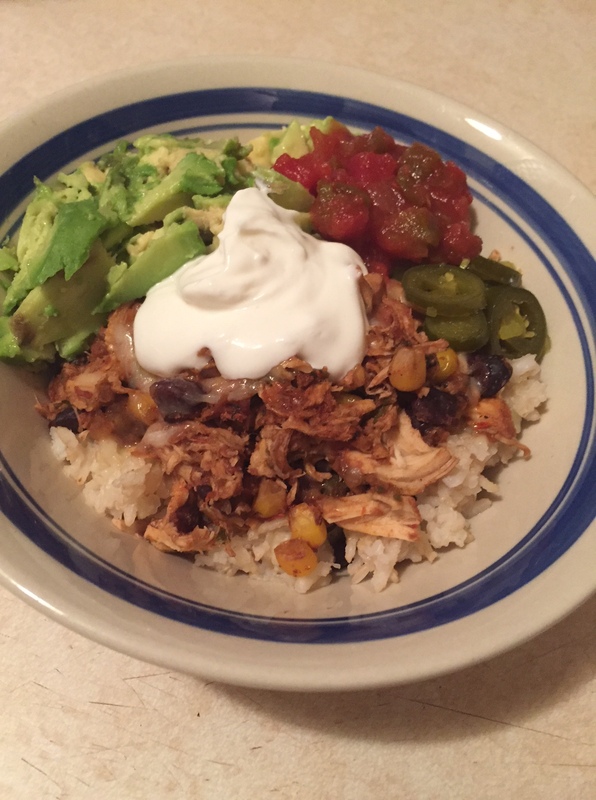 Customize it with whatever toppings you love and enjoy a quick and filling Mexican meal. 1.) Season the chicken with salt and add it to the crock pot. Top with the salsa, corn, black beans, garlic powder, cumin, and red pepper. Cook on low for 8 hours or high for 8 hours. 2.) Once cooked, shred the chicken and add the cilantro. 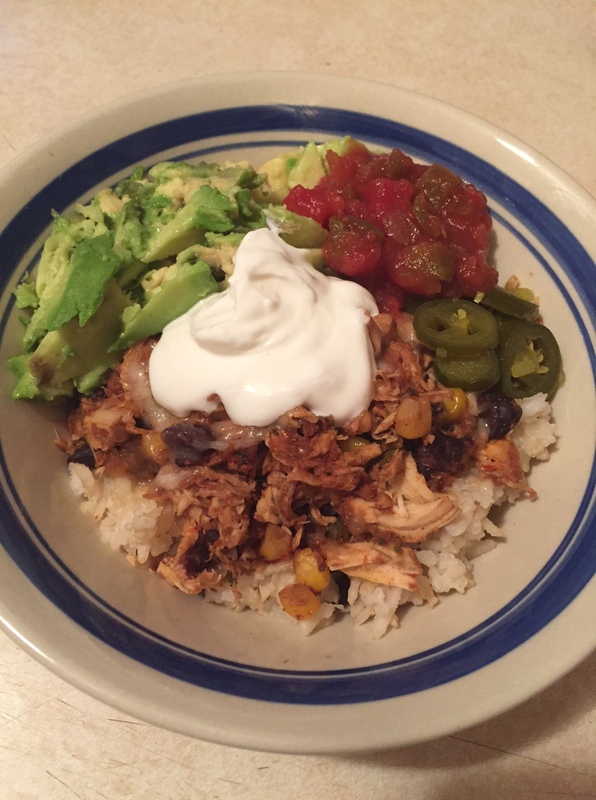 Pile into bowls on top of brown rice and top with any desired toppings. 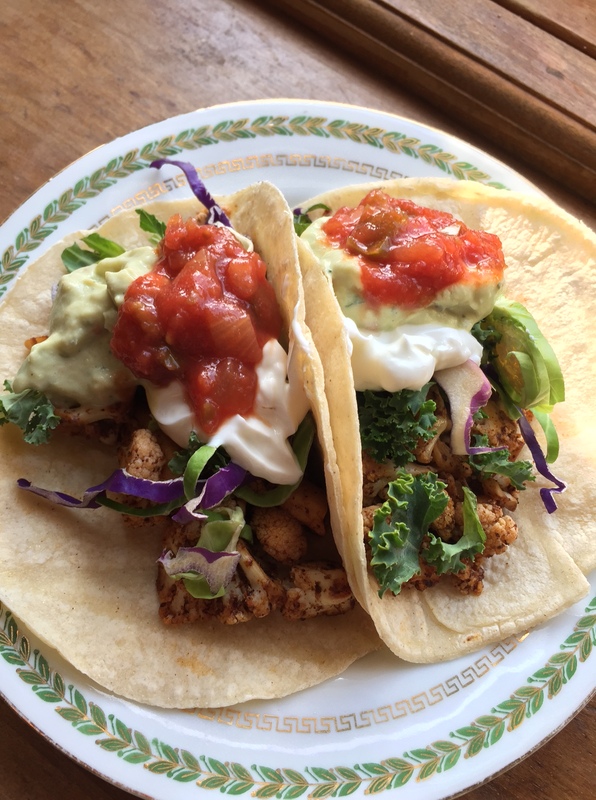 These meatless tacos came from an awesome cookbook that my brother got me for Christmas. 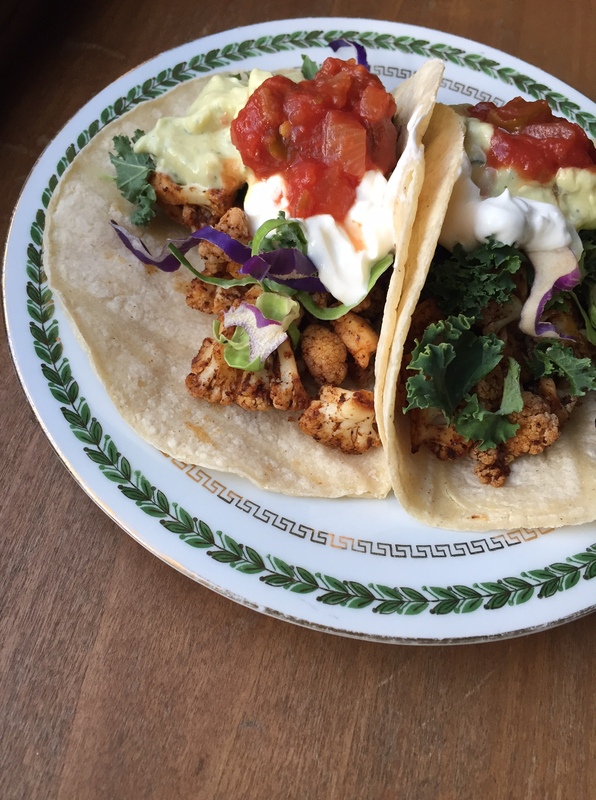 Thug Kitchen is full of creative vegan recipes written with a creative flair…they really tell it like it is. 😉 I was surprised at how good these tacos were, you definitely don’t miss the meat! These would be perfect for Meatless Monday or for sneaking in those extra veggies. 1.) Preheat oven to 400 F. Chop cauliflower into small florets. In a large saucepan, add the beer, broth, lime juice, soy sauce, hot sauce, and garlic over medium heat. Add the cauliflower and simmer for about 3-4 minutes, then drain. 2.) In a large bowl, add the salt, spices, and olive oil. Add the cauliflower and onion and stir well until coated. Spread onto a baking sheet and bake until browned, stirring halfway, for about 25 minutes. 3.) 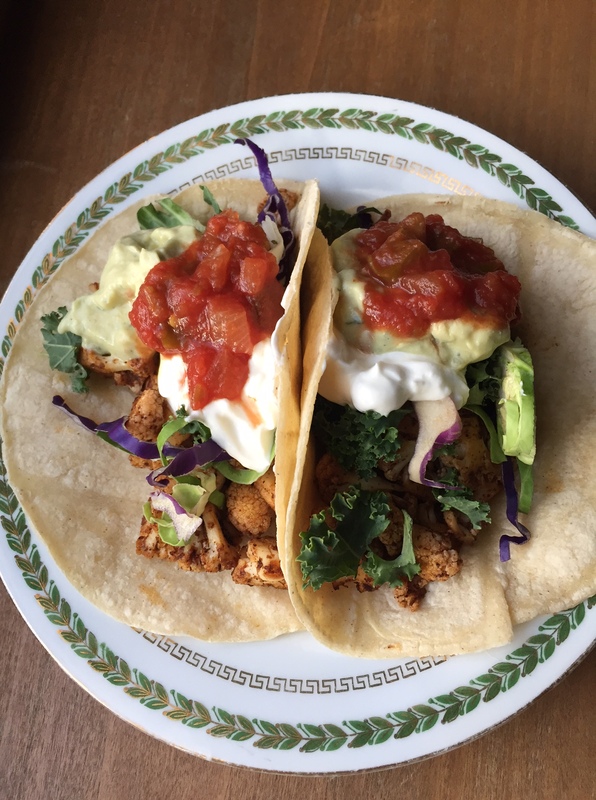 Warm the tortillas and fill with cauliflower and toppings! I love a good hearty breakfast, especially for mornings when I go into work early and have a long wait until lunch. I also love when I can make a big batch of something and eat it all week, since I like when I only have to cook once! 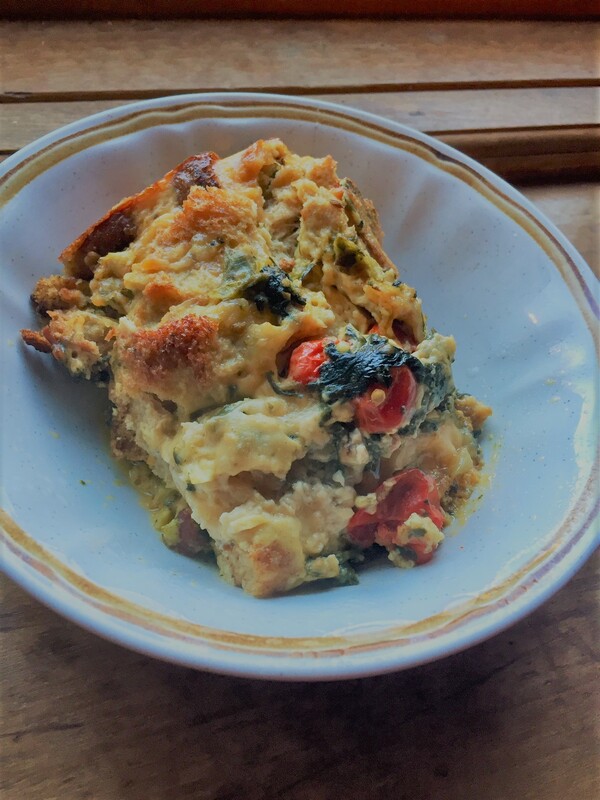 This breakfast strata is perfect for that. It makes enough servings to last all week, so you can grab it and heat it at work. It has the perfect combination of carbs, fat, and protein to keep you full until lunchtime rolls around. You can switch up the cheese, veggies, and type of bread to really make this your own. I think this recipe will be on repeat for me a lot this winter! 1.) Cook bacon in large skillet until crisp. Transfer bacon to a towel-lined plate and chop into small pieces. Add onion and garlic to drippings in skillet and cook until browned and soft. Add spinach and tomatoes and cook until soft. 2.) Spray an 8-inch square glass baking dish with cooking spray. Add bread cubes, bacon, veggie mixture, and cheese to the dish evenly. In a bowl combine milk, yogurt, eggs, egg whites, mustard, salt and pepper and whisk together. Pour over the bread mixture, cover, and chill for 8 hours or overnight. 3.) 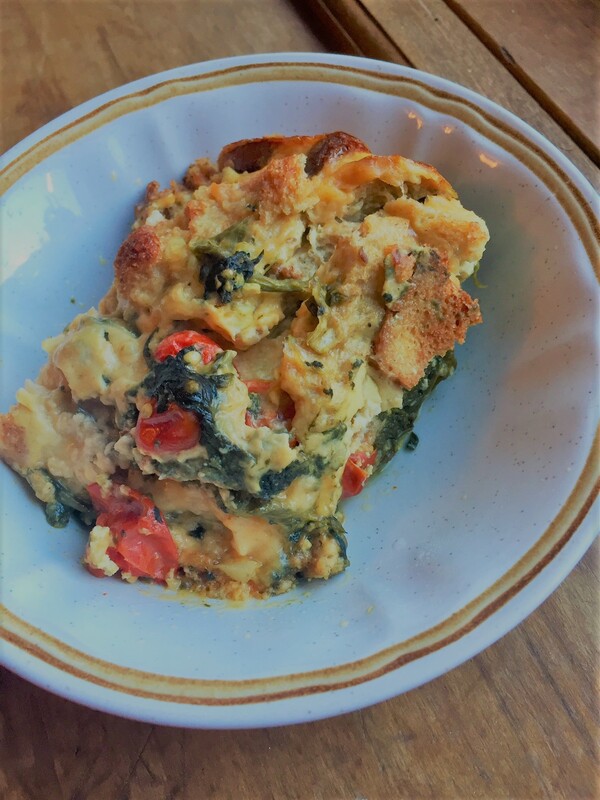 Preheat oven to 350 F. Uncover dish and let strata sit at room temperature while oven heats. Bake until top of strata is browned and a knife inserted in the middle comes out clean, about 1 hour and 15 minutes. 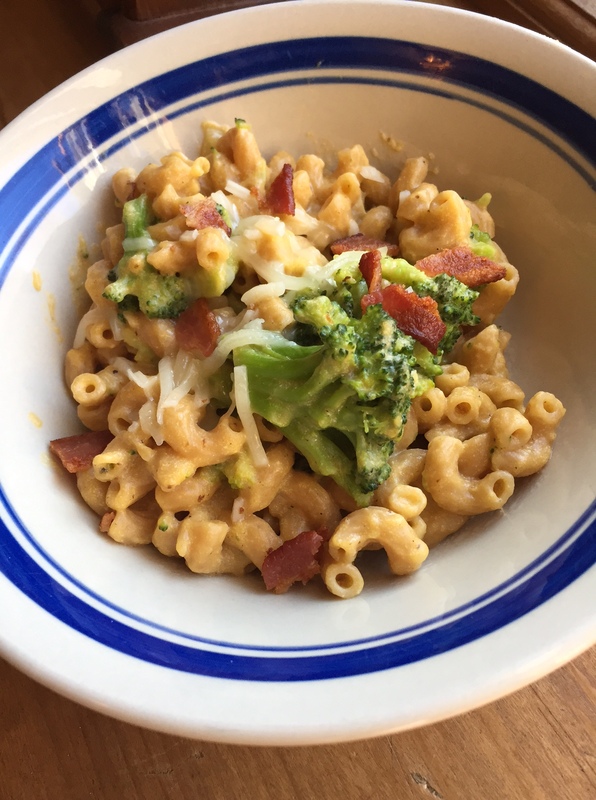 I just realized that my last three recipes were all full-blown comfort meals…I don’t mind it at all! This time of year certainly calls for warm meals that make you want to stay inside and forget about the cold New England weather outside. 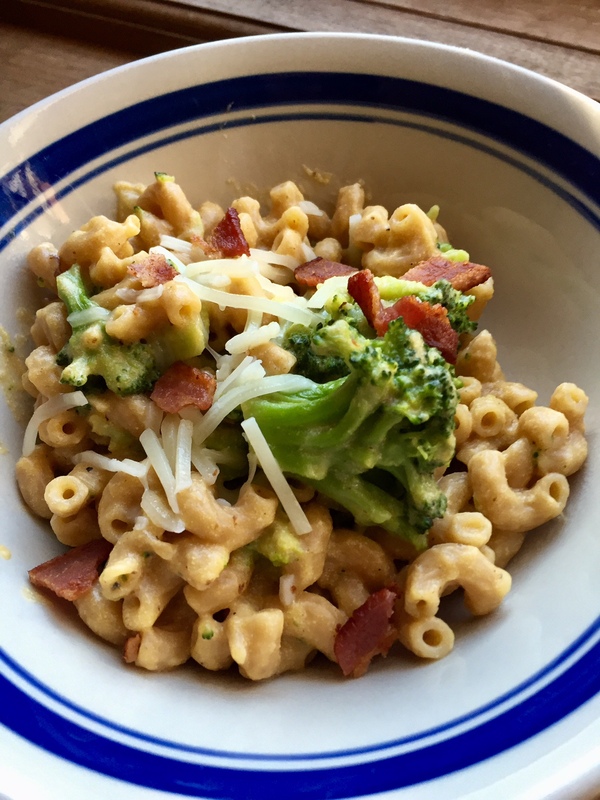 This mac and cheese was the perfect winter recipe – it has plenty of cheese while sneaking in a bunch of veggies! Then the addition of crumbled bacon is the perfect topping. Enjoy and stay warm! 1.) Heat a large skillet or dutch oven over medium-high heat. Cook bacon until crisp and remove from pan onto a paper towel-lined plate. 2.) Add onion and garlic to bacon drippings and saute until soft. Add stock, milk, and squash and bring to a boil, stirring occasionally. 3.) Add pasta, cover, and reduce heat. Simmer for 5 minutes, stirring occasionally, then add in broccoli. Cook until pasta is done and sauce is thickened. 4.) Add 1 cup of cheese and salt and pepper to taste. Sprinkle bacon and the rest of the cheese on top. I’m finally on winter break from grad school, which means I have time to catch up on blogging! I always say I’ll find time to blog during the semester and then all the homework and work and life gets in the way. So now is my catch up time! 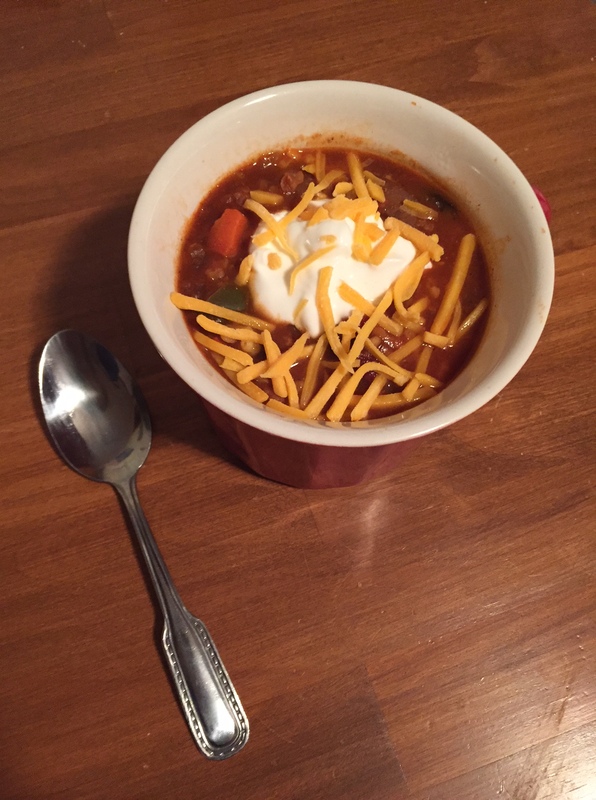 I made this chili when it first started getting cold this fall. It is very filling and the addition of grains give it a richer, heartier taste. You’ll forget there is no meat in it! 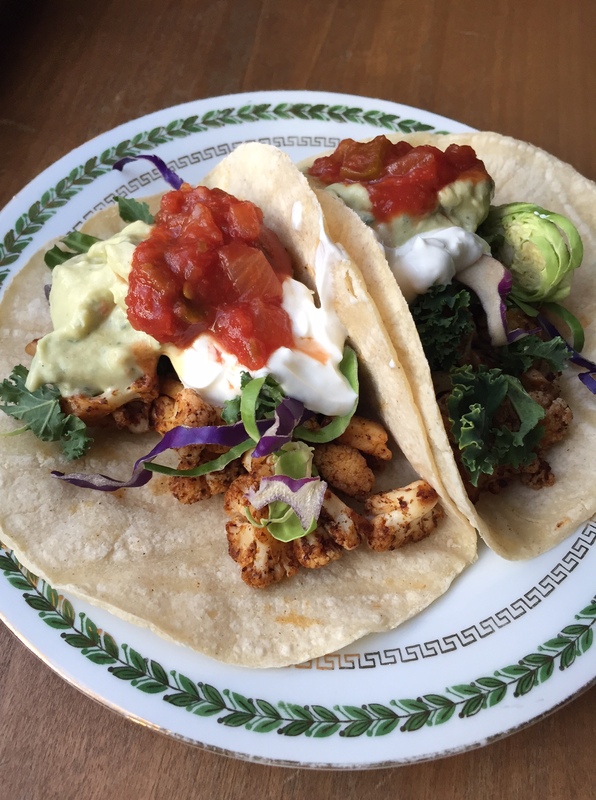 It’s the perfect recipe for Meatless Monday or just for those who love veggies! 1.) Heat a large soup pot or Dutch oven over medium high heat. Add the olive oil. Once hot, add the green pepper, mirepoix mix, jalapeno, mushrooms, and garlic. Saute for about 10 minutes or until the vegetables begin to brown. 2.) Add the tomato paste and spices (through paprika), cook for about 5 minutes, stirring constantly. Add the diced tomatoes, corn, and beef broth and bring to a boil. Reduce heat and simmer for 30 minutes. 2.) Cook freekeh (or other grain) according to package instructions. Add the cooked freekeh, beer, soy sauce, and beans to the chili and cook for 20 minutes. Serve topped with your favorite ingredients. 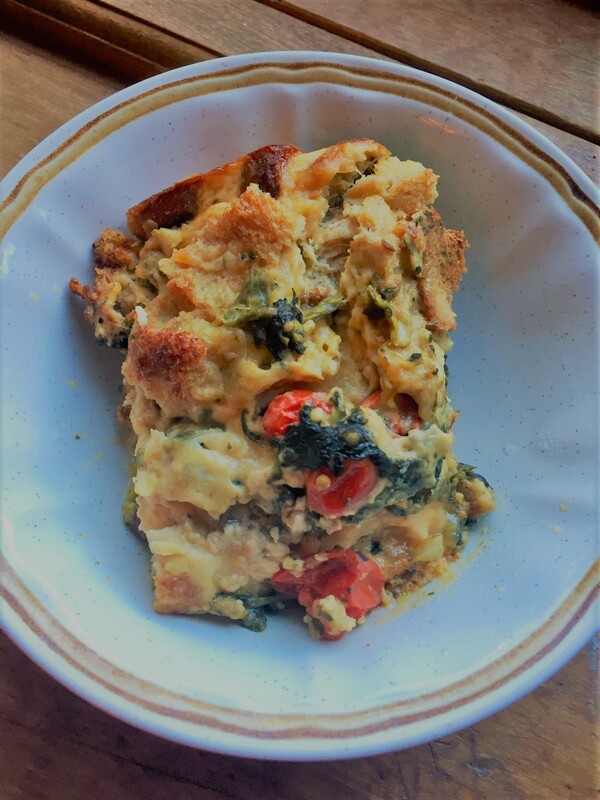 This recipe is perfect for cold fall/winter days, preferably in some cozy sweatpants by a fire. I rarely get a chance to hang around in my sweatpants by a fire, but I certainly have had plenty of cold occasions to enjoy some soup! 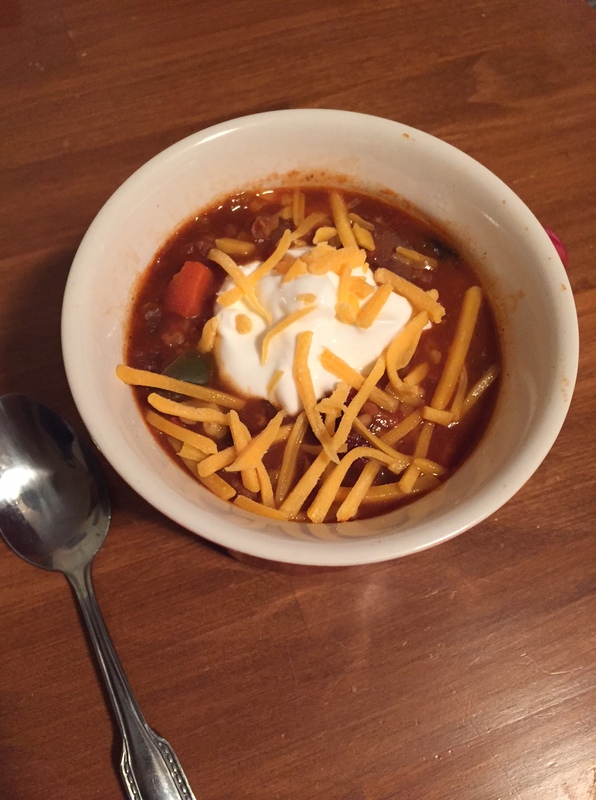 This soup was really easy to make and is very hearty. It’s got lots of cheese (which is always a good thing), the slight sweetness from the apples, and the rich flavor that comes from the beer. It’s the perfect comfort food! I served it with a roll and a side salad with blue cheese, apples, and walnuts. Delicious and filling! 1.) Heat a large soup pot or Dutch oven over medium heat. Add the olive oil. Once hot, add the onions, garlic, and a pinch of brown sugar. Cook about 5 minutes, stirring frequently, until softened. Then add the bacon and cook for about another minute. 2.) Slowly add in the apple cider, let it cook into the onions, add some more and continue to cook. Do this until the onions are caramelized. 3.) Add the apple and thyme to the pot and cook over medium heat, stirring, until softened. Add in any remaining apple cider, the beer, chicken broth and red pepper. Bring to a simmer and cook 5-10 minutes or until the apples are tender. Season with salt and pepper. 4.) Meanwhile, whisk the flour into the milk until smooth. Set aside. Once the apples are soft, bring the soup to a low bowl. Whisk in the milk mixture and boil until the soup thickens slightly, about 5 minutes. 5.) Stir in the cheddar cheddar cheese and brie until melted and smooth. Simmer the soup 5 minutes or until ready to serve. Top with a little extra cheese and serve!